Another week has already gone, and another week where it was a bit hard to think of small pleasures again, but as usual there were quite a few. First off this Māori proverb that I picked out at a workshop I was at this week. I really like it – it speaks to me. And so to some other small pleasures this week. I really shouldn’t be buying any more clothes, but to paraphrase Marie Kondo, if it brings you joy, then buy it…and this silk top from Jac and Jack is just one of those things that brings me joy. I put it on and it screamed ‘buy me’. 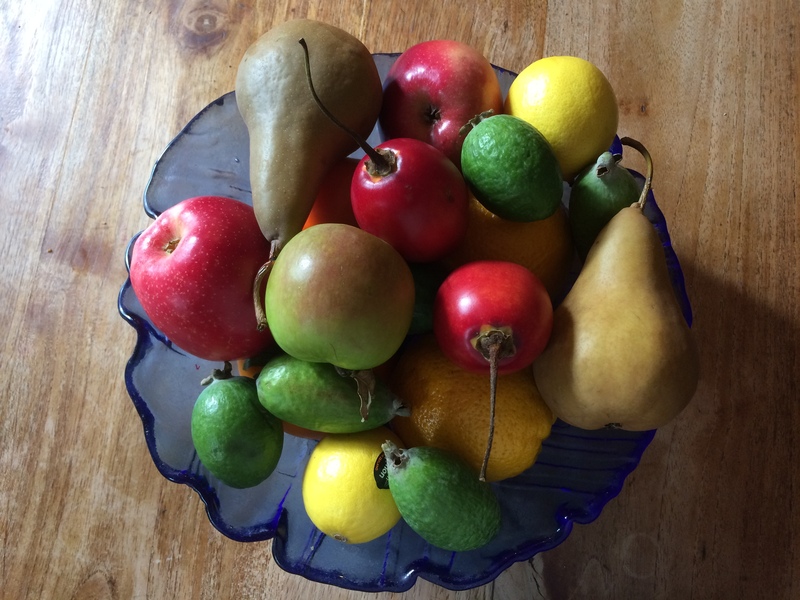 Apples, pears, oranges, persimmons, passion fruit feijoas, tamarillos – I really love these colours all put together in one blue bowl as you can see in the featured image at the top of the post. Or put together with yoghurt for a breakfast treat. I’m not usually keen on bunches of miniature roses, but these ones looked so nice. Use chorizo and courgettes as they were in the fridge, and some lovely little pasta shapes and cannelloni beans. See frugal feeding for inspiration. Check out Middle Europe‘s small pleasures too, and also Whimsey Pie.